As you prep up for Raksha Bandhan, you relive the fond childhood memories with your dear brother. Today, you might be parted by distance as he lives in Noida but that should not come in the way of expressing your love towards him. So, why not avail rakhi delivery in Noida for your brother with FlowerAura? Rakshabandhan is here, and it's the perfect time when you should gear up with the preparations for this gala festival! Isn't it? And the happiness of this occasion increases if celebrated with your dear brother. But, with changing lifestyles people are always on the move and hence, it's not easy to manage things all at once as most of the working brothers are not available at festivities. It's when FlowerAura comes to your rescue by providing an online platform through which every sister can send their tokens of love to their brother on Raksha Bandhan across India. So, if your brother lives in Noida away from you and cannot make it to home on Raksha Bandhan, send rakhi to Noida for him from FlowerAura. 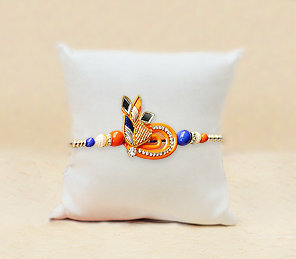 We provide a wide range of gorgeous rakhi online designed with utmost creativity. To make your rakhi tokens more alluring for your dear brother, we also provide rakhi with chocolates combo, rakhi with sweets combo, and rakhi with dry fruits combo etc in Noida. In fact, now you don't have to go out to buy a rakhi for your brother because you can order online rakhi in Noida from FlowerAura comfortably seated at you home. Since it's Raksha Bandhan, you want to leave no stone unturned in making the celebration special for your dear brother. And, for this reason, you cannot take the risk of sending rakhi gifts online from such portals that do not offer express or same day rakhi delivery. Right? But, with FlowerAura's same day rakhi delivery in Noida, you don't have to worry at all. So, even if the thought of surprising your brother on Raksha Bandhan strikes your mind at the last hour, you don't have to fret because you can send rahi to Noida on the same day with FlowerAura. This Raksha Bandhan, send rakhi online to Noida and make your brother fee loved even if he is away from home via FlowerAura's online rakhi delivery to Noida. Raksha Bandhan is the time when sisters tie the sacred thread on the wrist of their brothers, thereby expressing their gratitude towards them. In turn, the brothers pledge to protect their sisters from unfavorable conditions. Like every other Indian city, Noida also catches up with the fervor of this heartwarming festival and celebrates it with much enthusiasm. The people of this industrial hub break free from the humdrum of the city and eagerly look forward to commemorating their special bond with their siblings! On this pious day, while every sister, send rakhi for her brother who lives miles away, the brother show his love by sending rakhsha bandhan gifts for sister. Therefore to make this beautiful exchange of rakhi tokens between brothers and sisters smoother, FlowerAura has come up with its hassle-free online rakhi delivery in Noida. Now, with just a few clicks you can order Rakhi online, and along with that, you can also purchase a plethora of goodies, roli-tikkas, and other dazzling & cutely wrapped Rakhi gifts from us and enjoy free shipping. If your dear brother residing in the city of Noida would eagerly wait for your Rakhi on the day of the festival. FlowerAura offers you the best rakhi for your brother to choose from such as American Diamond Rakhi, Pearl Rakhi, designer rakhi, rudraksha rakhi etc. So, if you wish to send Rakhi gifts to Noida, you must avail the services of FlowerAura, which lets you choose from a wide range of exclusive & designer Rakhi and Rakshabandhan special gifts with same day delivery option for those who are late in ordering or purchasing. With easy & secure payment options and express delivery, ordering online Rakhi is a just a cakewalk with FlowerAura. If your brother is living away in Noida and you still wish to make the occasion of Rakshabandhan special for him like you have been doing since childhood, FlowerAura's rakhi delivery in Noida is here to make the day amazing for you and your brother in the most delightful way. You can send Rakhi online to Noida from USA, UK, Australia, Canada, UAE, Dubai, Germany, Singapore, and Saudi Arabia and surprise your brother in the most love filled manner. With FlowerAura's extensive assortment of Rakhis and Rakshabandhan gifts online, you are sure to enjoy the charm of the occasion to the fullest despite you are miles away from your brother.